Cold case investigators scrape back paint in a renovated flat where a murder was committed twelve years earlier, and find a blood stain that leads them to a killer. Scientists extract DNA from crime-scene samples collected in 1973, and a 21st-century hunt for a triple murderer begins. A forensic dentist probes the mysterious death of an eight-year-old ancient Egyptian mummy. A document examiner reassesses the authorship of Johann Sebastian Bach’s cello suites. 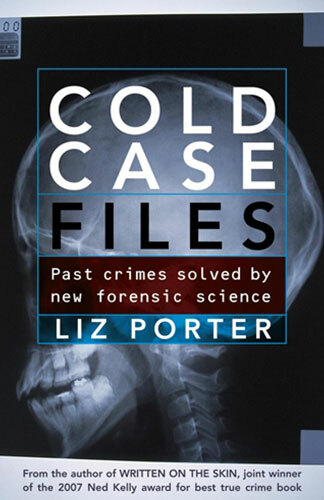 In this collection of fascinating cold cases from Australia, the UK and the US, award-winning writer Liz Porter shows how modern forensic science can unlock solutions for crimes and mysteries unsolved for decades, and, in some cases, centuries. This is Melbourne journalist Liz Porter’s second book and it is a fascinating read. The first 26 pages are devoted to explaining just what cold cases are and how they are dealt with by forensic scientists. Blood groups, fingerprints, hair analysis and DNA are explained along with tantalising examples of cases solved forensically. But this is merely an entrée, a foretaste of things to come. Porter starts Chapter One in 2002 with an exhumation in a Welsh graveyard, so that scientists could take DNA and compare it with the genetic profile of an unknown killer. The crime had been committed in 1973. Chapter Two, Saving Andrew Mallard, relates to the 1994 Perth murder of Pamela Lawrence for which Mallard was wrongfully convicted. Many may remember the case. Colleen Egan, a Perth journalist, took up the fight to save Mallard four years after his conviction. It seemed much evidence had either been ignored or manipulated. It took until 2006 and a second appeal to the High Court before a retrial was ordered. The Perth police wisely decided not to retry Mallard and he later took a settlement of more than $3,000,000 Later in 2006 Simon Rochford was identified, by a palm print found at the scene, and convicted of the murder. If the foregoing has whetted the appetite for more there are another 16 Chapters to go. This is a slow read, a very time-consuming book. It is well-written, very detailed and not something to read before bed-time. Enjoy.